In the summer, a couple of guys and I went down to San Diego for a couple of days to drink beer at as many breweries as we could. On the second day of our trip, having visited Ballast Point, Societe Brewing, Council Brewing, and Modern Times, we then stopped at our final brewery tasting room of both the day and the trip. Having been not too far from Modern Times, we visited Acoustic Ales. 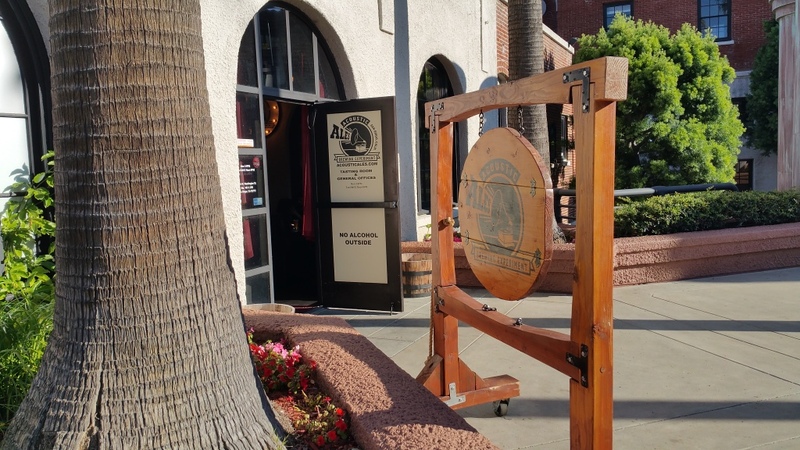 Walking into the tasting room of Acoustic Ales, located in the Historic Mission Brewery Plaza, one easily apprehends that the the musically influenced theme of the visual aesthetic is reflective of the name of the brewery, although the names of the beers didn’t necessarily reflect this theme. 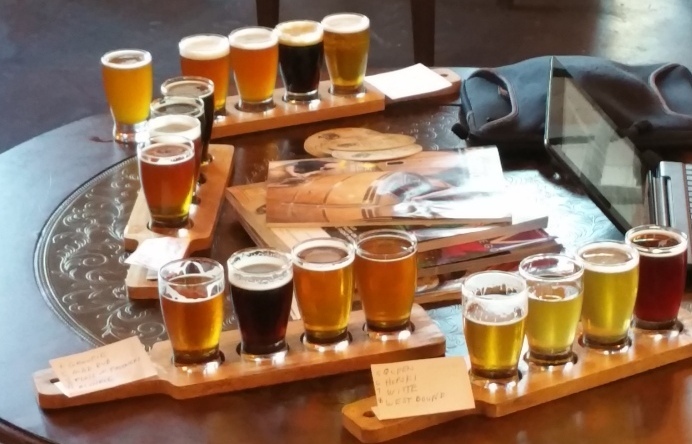 Speaking of the beers, since it was our final stop of our brewery-hopping, we ordered all 17 beers on-tap, which came out on paddles in flights of four (well, since there were 17, it ended up being four paddles, plus an orphan taster glass). 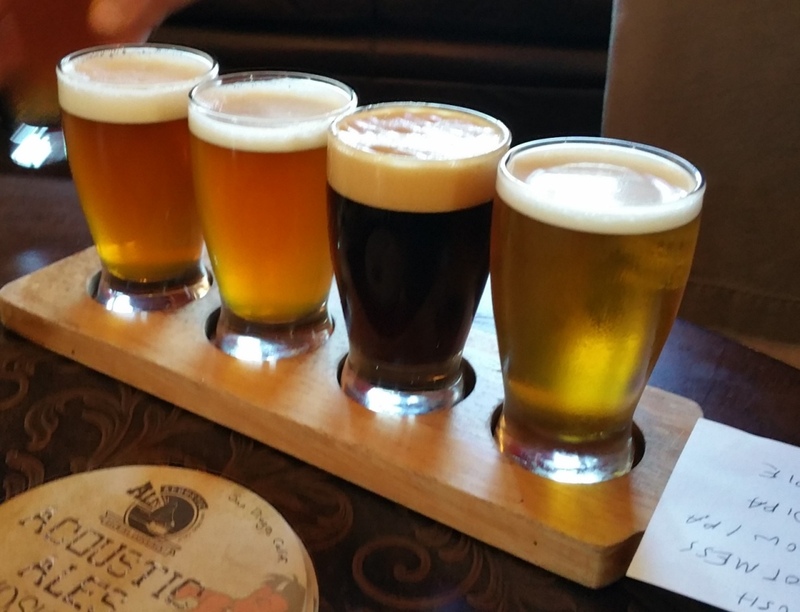 In our first flight, we started off with the Groupie Belgian Strong Blonde Ale (8% ABV), a Belgian strong blonde ale, which was raisiny, dark fruity, but also – interestingly – a quick finish. Next up was Mad Dub Belgian Brown (7% ABV), a Belgian brown ale, which was meh, not too much. I’m not a big brown ale fan, and this doesn’t do much for me. It, too, had a very quick finish. Next up was Flock of Falconers XPA (4.5% ABV), an XPA, which I enjoyed greatly. It enjoyably had a small body and a lovely bouquet of pineyness and some dankiness and even some tropical fruity notes, with some cut grass. Rounding out this flight was the Blondie American Blonde Ale (6% ABV), an American blonde ale, which was not that light of a beer and I didn’t particularly care for this beer; also, it was not much of a blonde – it was darker than the beers to come. For our second flight, we had the Hop Save the Queen English IPA (5.5% ABV), an English IPA, which tasted of stonefruit and honey, with some not insignificant malty characteristics (some diacetyl, some citrus), and a quick finish. Next up was Hopski Pre-Prohibition Style Lager (5% ABV), a lager, which had coffee notes (at least for me), and it was kind of fruity and pleasant, with a quick finish. Third up in this flight was the Witte Snake Belgian Witte Bier (4.5% ABV), a witbier, which was cute, crisp, quick finish, citrusy, and toasty. Rounding out this flight was the Westbound and Down Belgian Quad (10% ABV), a Belgian quadrupel, which was malty with dark fruits, somewhat boozy, and very delicious – a welcome change from the previous wheaty beers. Moving onto the third flight, we started off with the Back in the GSSR Rye IPA (6.25% ABV), a rye IPA, which had a very lovely pineyness from the hops and not much of the body and some berryness; this was very delicious. Next up was their ESB (6% ABV), an ESB, which was my favorite ESB ever – fruity and hoppily bitter. The others in my group didn’t care for it and didn’t think it should be considered an ESB, but I greatly enjoyed it and its fruitiness. Following that was the Unplugged Imperial Chocolate Stout (9.5% ABV), a stout, which was raisiny, darkfruity, chocolaty, and big. Finishing up this flight was the Barrel-Aged Unplugged Imperial Chocolate Stout (12.5 % ABV), an imperial stout, which was amazingly delicious versus the non-barrel-aged- it has vanilla-yness and syrupyness and more boozy – this beer is very yummy. For our final flight, all five of these beers were either on nitro or out of casks. First up was the Tush Session IPA on Nitro (5% ABV), a session IPA, which was soft and piney. Next up was the Hot Mess Stout on Nitro (9.5% ABV), a stout, which was boozy, dark fruity, some coffeeness, smooth, and delicious. Following that was Willow Wolves with Falconers Hops from a cask (~6% ABV), an IPA, which was yummy, smooth, and maybe some oregano or some herbality to it – (perhaps bayleaf(? )), and some fruitiness, berry, perhaps. This beer was really fascinating. Moving on to another cask beer was Run for the Hills with Cascade and Citra Hops (~7% ABV), a double IPA, which evinced some fascinating green herbness, which was really interesting. However, some people in our group didn’t like it, but I found it fascinating; not that I liked it or hated it, but it was amusing to drink. The final beer of our drinking visit was the Groupie with Fresh Grapefruit (8% ABV), a Belgian Strong Pale Ale on cask, which was smooth, grapefruity, and very delicious. I loved this beer’s tart, dry, and deliciousness. However, once again, the rest of our group didn’t like it, but I stand by my palate; this beer is really yummy. I enjoyed that Acoustic Ales offered almost a dozen and a half of their beers on-tap and that they were trying to do some fun things with their beers. 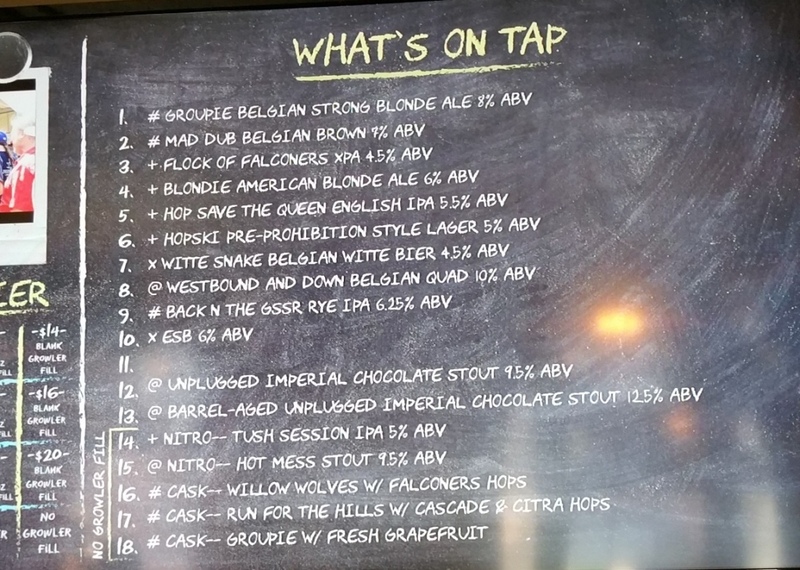 Some beers that stood out to me that I enjoyed were the Flock of Falconers XPA, Westbound and Down Belgian Quad, Barrel-Aged Unplugged Imperial Chocolate Stout, and Willow Wolves with Falconers Hops on cask. One point that must be made is that my drinking compadres did not like several of the beers – just did not like them. Curiously, it ended up being that the ones they particularly disliked ended up being favorable to my palate. As can be seen from reading my notes above, I enjoyed most of the beers, which is good and would be worth a return trip. 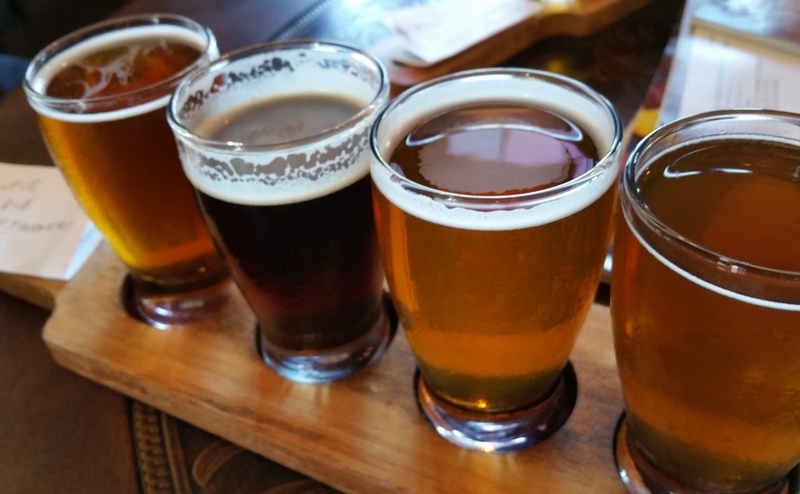 One issue that is baffling is the order in which they serve their beers, particularly in tasting flights: there is no particular order! 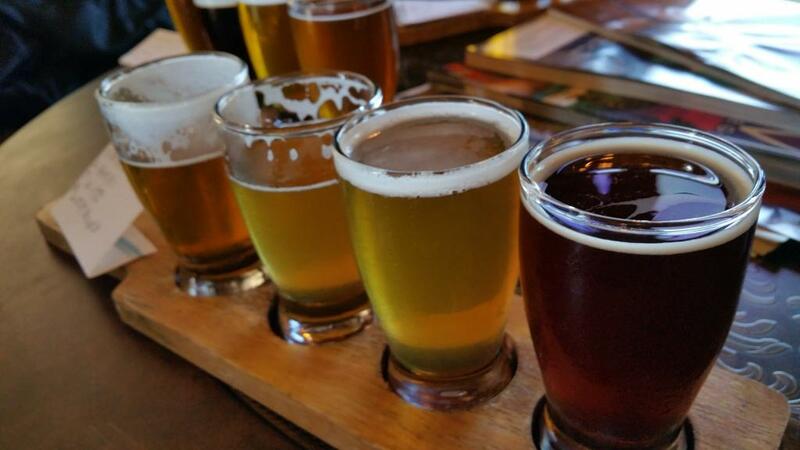 Why not create a specific tasting order (whether lighter to darker, low ABV to higher, low hops to more hops, etc. ), enabling those coming in to experience their beers to do so in a way that makes sense. In any event, the beers were pretty interesting and I would come back to drink them.